After years of tracing appliqué designs onto fusible web without the aid of a light table, I finally gave in and purchased a light pad to make it easier to do this. While I’ve been using a window, when required, this doesn’t work very well at night, so I thought that having a light pad would be a big help. I hadn’t looked at light tables or pads for several years and was pleasantly surprised to find that there have been big improvements in this area. Previously light tables were thick and bulky and were rather pricey. In searching for a light pad, I discovered that there are now a variety of choices in different price points making it easy for you to find exactly the size you want at a price with which you can be comfortable. I chose the Huion L4S light pad due to the price point and the size. While I do have to plug it into the USB port on my laptop to use it (I could’ve bought a battery option, which was quite a bit more expensive), I don’t find that this is an inconvenience. Once I’ve plugged it into my laptop, I press the button to turn it on and hold my finger there until it reaches the desired brightness. The nice feature of this light pad is that the light on it is dimmable. By simply keeping my finger on the on/off button, the light on it will dim. A nice feature to have! The Huion L4S light pad is also surprisingly lightweight and thin. This makes it easy to transport and store as well. I found that the light on the Huion L4S was bright enough, not only for me to trace through fusible web, but also to trace on freezer paper. I hadn’t expected that and was pleasantly surprised by this ability. I’m happy with this purchase and look forward to putting it to use on my next fusible web appliqué project. If you are considering purchasing a light table, I can definitely recommend the Huion L4S light pad. To see more features of the Huion L4S light pad, click on the image below to watch a video on my YouTube channel. Looking for the perfect pen to use on tracing appliqué or embroidery designs on fabric? Well, the truth is that there isn’t one perfect pen: there are air erasable, water erasable, chalk, etc. and each of them have their pros and cons. My favourite temporary marking pen to use is the Pilot Frixion pen. It creates an easy to see mark that can be erased later by the heat of an iron. There is one possible problem: there are rumours that the marks might come back when exposed to cold. To see if this was true, I decided to put the Pilot Frixion pen to the test. I could easily remove the marks made by the Frixion pen with my iron as the ink is removed with heat. Remember, these pens were originally designed to be used on paper and not for fabric (don’t use a Frixion pen to write a cheque!). While the marks came off easily using an iron, I wanted to see if they would come back when exposed to extreme cold. After tracing a few designs onto cotton fabric, I put the sample in my freezer and left it overnight. I thought that this would probably be the coldest that my fabric might ever get – and hopefully it never gets this cold in my studio! The marks did come back on the fabric, but I could still easily remove them again with the heat of an iron. There can be similar issues with other types of temporary fabric marking pens, so always be sure to do a test before you use a product on your fabric and find out that the marks come back and can’t be erased again. To learn more about using Pilot Frixion pens on your fabric projects, click on the image below to watch a video on my YouTube channel. If you haven’t tried out the Pilot Frixion pen, I would encourage you to do so. They are inexpensive and readily available in most office supply stores or you can click here to get some for your studio. Fusible web appliqué, or raw edge appliqué as some people call it, is the easiest form of appliqué, at least in my opinion. 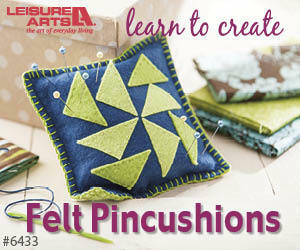 It's easy and fast and perfect for an appliqué beginner. The only thing you need to remember is that wrong is right! You are working with the wrong side of the fabric for your appliqué pieces, not the right side. Keep this in mind as you work through this technique and everything will turn out just fine. You don't need many tools to do fusible web appliqué: some fusible web, a marking pen or pencil (I like to use a Sharpie Extra Fine Point Permanent Marker) and the appliqué template. You just need to trace the appliqué shape onto the fusible web, cut the shape out and then press it to the wrong (back) side of the fabric. Next you cut the shape out exactly on the drawn line, remove the paper lining and iron the appliqué shape to the background fabric. Simple, isn't it? To give you an idea of how to do this type of appliqué, please watch the video below or on my YouTube channel. I use fusible web appliqué in all my patterns and the Community Quilt Along, which started yesterday, is also constructed with this easy technique. In fact, the sample I'm using in the video is part of the Community quilt. It's not too late to join me in this online quilt along, so if you are interested, you can find out more information about it here. Have you tried fusible web appliqué? Let me know your thoughts on this simple technique in the comments below.